Part of your cat's daily routine is his morning helping of his favourite pouched meat. 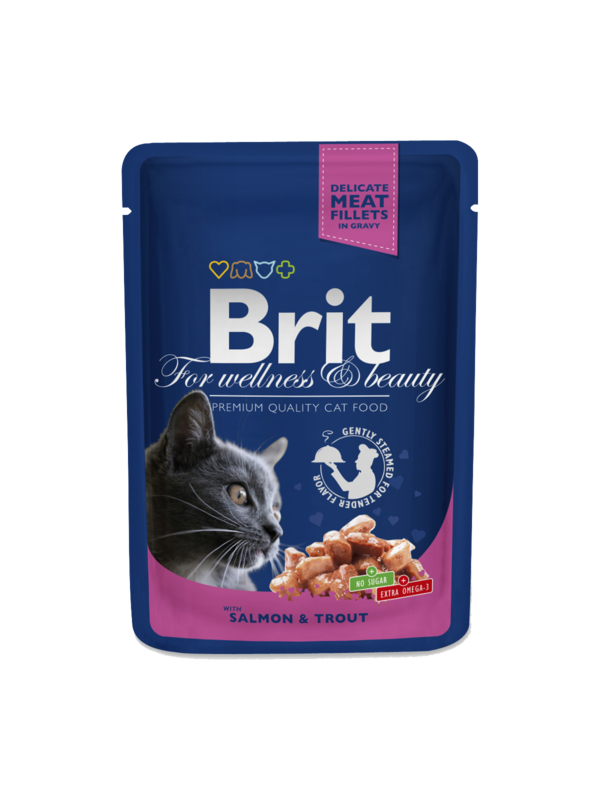 Meat pouches Brit Premium suit cat's natural preferences and their specific needs. Composition: 60% meat and animal derivatives in chunks, 16% fish and fish derivatives in chunks (8% salmon, 8% trout), derivatives of vegetable origin (0.4% of inulin), minerals. No Colorants, No Preservatives. Analytical ingredients: crude protein 8.5 %, fat content 4.5 %, crude ash 2.5 %, crude fibre 0.4 %, moisture 82 %. Nutritional composition: Vitamin D3(E671) 250 IU, Vitamin E(α-tocopherol) (3a700) 100 mg, Zinc(3b606) 10 mg, Manganese(E5) 2 mg, Iodine(3b201) 0.7 mg, Copper(E4) 0.2 mg, Taurine(3a370) 450 mg, Biotin 0.1 mg.